Pod coffee systems offer a convenient and consistent coffee experience with every cup. Whatever your favourite coffee experience is, there’s one for you. Perhaps a frothy Cappuccino, an Americano, a Latte or for the real enthusiast the Espresso. Pod coffee machines can make them all and much, much more. Making your favourite coffee in a coffee pod machine is so easy. It really is as simple as that to make a delicious, stylish coffee at a fraction of the price you would pay in a coffee house. Why Choose a Pod Coffee Machine? If you want quality real coffee ready in an instant, with no fuss, no mess and and consistent, repeatable results, pod coffee machines are for you. A brilliant accessory to any kitchen plus they look great. Ideal for when you have friends round. 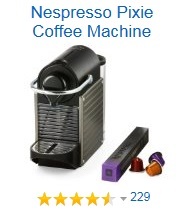 And why not give a pod coffee machine as a Birthday, Christmas or Wedding gift? Enjoy perfect Lattes, Americanos, Espressos, Cappuccinos and many, many more exciting coffee drinks. Convenient, hot and ready to drink in seconds. Now you don’t need to step out the door to enjoy Coffee Shop qualities and aromas. Which Pod Coffee Machine should I buy? There are quite a few different brands of pod coffee machine available, so which one should you buy? Your choice will depend on the range of coffee pods available, the price range of the pod coffee machines and their pods, design aesthetics of the machine, ease of purchasing pods, etc. I have a De Longhi EN125S had a early cup of coffee went to work got home in afternoon to find water all over kitchen bench top and water tank empty Please Help or is it time for a new one?? Hi, have a Pixie Clips machine, brand new. A pod is stuck in the housing of machine – not on water side so can’t flush out..
Is it wize to dig & try to force it or does this machine have a ‘release’ – obviously not working very well! Would appreciate any help thanks!